Cho-Liang Lin | The Chamber Music Society of Lincoln Center. Violinist Cho-Liang Lin is lauded the world over for the eloquence of his playing and for superb musicianship. In a concert career spanning the globe for more than 30 years, he is equally at home with orchestra, in recital, playing chamber music, and in the teaching studio. Performing on several continents, he has appeared with the orchestras of New York, Detroit, Toronto, Dallas, Houston, Nashville, San Diego, and the Los Angeles Chamber Orchestra; in Europe with the orchestras of Bergen, Stockholm, Munich, and the English Chamber Orchestra; and in Asia with the orchestras of Shanghai, Hong Kong, Singapore, Malaysia, Bangkok, and the National Symphony Orchestra of Taiwan. An advocate of contemporary music, he has collaborated with and premiered works by Tan Dun, Joel Hoffman, John Harbison, Christopher Rouse, Esa-Pekka Salonen, Lalo Schifrin, Paul Schoenfield, Bright Sheng, and Joan Tower. Also an avid chamber musician, he has made recurring appearances at the Chamber Music Society of Lincoln Center, the Aspen Music Festival, and the Santa Fe Chamber Music Festival. 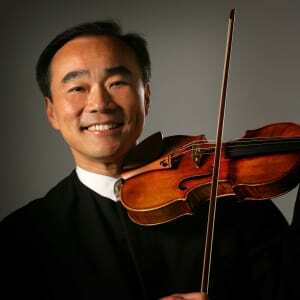 As music director of La Jolla Music Society’s SummerFest since 2001, Mr. Lin has helped develop the festival from one that focused on chamber music into a multidisciplinary festival featuring dance, jazz, and a new music program. He also serves as artistic director of the Hong Kong International Chamber Music Festival. In 2000 Musical America named him its Instrumentalist of the Year. He is currently a professor at Rice University’s Shepherd School of Music. He plays the 1715 "Titian" Stradivarius.